"A few months ago I went to a sales presentation and the sales representative asked if I was interested to sell my timeshare for about twice what I paid for it. The offer was only available for that day and we agreed to buy the timeshare. We left a down payment of U.S. $ 4,000 and the remainder was to be financed over 3 years with no penalty for prepayment. We told the salesperson that we needed the timeshare to sell in less than 6 months and because we would be using that money to pay for the newtimeshare. These are very common complaints that we receive from clients.Timeshare vendors are well aware that it is unlikely that a customer who already owns a timeshare would want to purchase a second property. Many sellers are very convincing and promise potential clients hefty financial returns for the sale of their oldtimeshare. But, what is the problem? The resale value of timeshares is much less than what a customer would expect. In these times of economic downturn where people buy only what they really need, it is not uncommon to find timeshares purchased in Mexico for $ 30,000 for sale on websites such as EBAY or REDWEEK for only $ 500 U.S..
Why is that? Consumers have been educated and realize that it is cheaper to buy a vacation package on the internet than to have to pay thousands of dollars upfront in addition to annual maintenance fees. Ultimately, timeshares do not have the expected value for consumers. Any salesperson that has at least a couple of months working in the industry knows that timeshares have an economic value much lower than the customer desires. 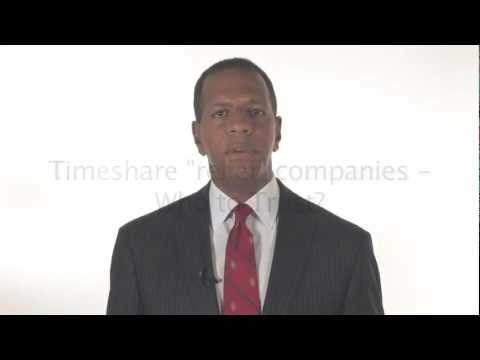 This is why they engage in deception by claiming to potential customers that if they buy a new timeshare, they are committed to help selling their current timeshare. Salespeople will even go to the extent of saying that they already have buyers for their timeshare. This is clear deception and fraud, and is a criminal act in Mexico. Timeshare contracts protect the interests of the seller and they wash their hands by having the clients sign disclosure statements when it was the developer´s salesmen making false statements about the membership in the first place. "This contract, promissory note, regulation and customer protection contract represents the entire agreement between the developer and the customer. In case of any discrepancy, THE CLIENT agrees that any verbal or written agreement not in the official contract will be void." In short, if it is not in the main contract, it is not valid, even if the salesperson signed in blood to give their word. A similar type of timeshare fraud occurs with outside timeshare rental and resale agencies. These companies buy the database of customer information from the developers and are dedicated to making calls to the owners and promising great returns for the rental or sales of their timeshares. Whether selling them for good or renting the weeks the client will not use. These fraudulent companies operate by asking for a deposit in advance for the evaluation or promotion of the property. The cost varies depending on the client but is normally about $ 500 U.S. Once the client makes the deposit, it is unlikely that the client will hear from the company again about the rental or resale of their property. There have been instances, however, where the rental or resale company contacts the client to advise them that they have a buyer for the timeshare but the client needs pay the taxes from the sale of approximately $2,000 U.S. which will be refunded upon termination of the transaction. Of course, when these taxes are paid upfront, the client does not hear from the rental or resale company again. This means that one must learn from past mistakes. There are many companies offering to help people who have been victims of timeshare fraud and collect money in advance for doing so. There are companies that even offer cancellation insurance. You must be careful because this could be someone wanting to scam you again. Unfortunately, there is virtually no resale market for timeshare anymore. The market has collapsed and the stark truth is most timeshare is worthless. Ebay is full of timeshare weeks unsold for only $1. The sellers would of course be quite happy to sell for eve less just to rid themselves of timeshare. All I do know is that when I looked at the numbers for becoming involved in a timeshare, they didn’t work. I’ve not been able to figure out why anyone would want to buy one. These are great reasons never to own a time share. Personally, I would not own one either. Just rent a house when you want to vacation. Never pay upfront fees, PERIOD! it will protect you from 99% of all Timeshare resale scams. I’ve only been to one time-share presentation (nearly 20 years ago). Once I added up all the costs it was clear that buying one would be a financial disaster. The property taxes and a host of other fees added up to $800 each year for a one-week share! And those were 1992 dollars. The costs went even higher for the right to trade a week with some other time-share. They tried to sell me the time-share for $10,000, but I wouldn’t have taken the thing if it was free. For anyone considering buying a time-share, check out all the ongoing costs before you buy.